First of all, I note that I am described in the brochure as Derek Antrobus, local councillor and author on the history of vegetarianism. You might be puzzled about the relevance of my being a local politician. I was elected to Salford City Council in Greater Manchester in 1979 and I was delighted to discover in 1985 that it was a group of local politicians in Salford who played a crucial role in setting up the Vegetarian Society. Joseph Brotherton, who chaired the meeting which established the Society in 1847, was the Member of Parliament for Salford. William Harvey, a Mayor of Salford, was our second president. His son-in-law James Simpson, was the first president. Given our venue, it is worth noting that James Simpson's father was Scottish and one of the first things he did on becoming president was to tour the major towns of Scotland, lecturing on vegetarianism. More of them later. But, like many people who haven't explored vegetarian history, I was astounded by the discovery that my Victorian forebears were active and organised vegetarians. Most people associate vegetarianism with beards, sandals and the 1960s. That comes across strongly in the media. The British Independent on Sunday newspaper, for example, published a positive story on vegetarianism under the heading 'No longer leftie weirdos' (June 25th, 2000). A sympathetic academic, Daniel Dombrowski, in his excellent Vegetarianism: The Philosophy Behind the Ethical Diet, suggests that vegetarianism died out in ancient times and was re-born Phoenix-like in the mid-20th century. Such comments perpetuate the myth that until recently, vegetarianism was the diet of cranks. The story that is told helps to give the impression that vegetarianism is a precarious philosophy, a New Age novelty, as likely to be a fad as a fundamental shift in behaviour. But, of course, vegetarianism has been dominant in many societies for 2,500 years. Modern research also calls into question the view that vegetarianism is a purely 20th-century phenomenon. As Colin Spencer's magnificent book The Heretic's Feast demonstrates, there has always been a strong undercurrent of vegetarianism in western society. And I want to argue that, although not dominant, it was certainly mainstream in Victorian England. I am always amazed by the fact that in 1870s Salford and Manchester - twin cities which sit astride the River Irwell - there were probably more vegetarian restaurants than there were in the 1970s. The cities boasted eight restaurants plus a vegetarian lecture hall with two dining rooms and a satellite café. To understand why, we need to go back to January, 1809, to a small chapel in Salford where followers of the Swedish mystic Emanuel Swedenborg met. On this occasion, there would be a buzz of expectation among the congregation as they sat on the green baize of the white-painted pews. The rumour had gone around that something important, new and exciting was to be said. a sermon which instructed his congregation to abstain from meat. We cannot know what he said but he would certainly have argued that a vegetarian diet was good for health for he was profoundly influenced by Dr George Cheyne (1671-1743) the foremost exponent of this view. He would surely have also argued that a vegetarian diet would make its adherents of a less aggressive disposition for he is reported as noting on a later occasion "All the mildly disposed animals eat vegetables, while the savages of the forest are universally carnivorous." Meat-eating, he would say, was unnatural. If God had meant us to eat meat, then it would have come to us in edible form "as is the ripened fruit". Can crime like this be small? In other words, to destroy any living thing was to destroy a little bit of God. The sermon had both immediate and lasting effects. 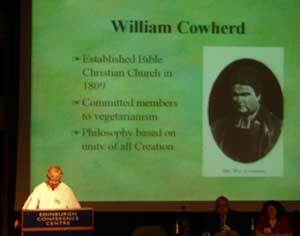 It precipated a split between Cowherd and the Swedenborgian leadership who regarded vegetarianism as "a pernicious doctrine". By the summer Cowherd had established the Bible Christian Church which consisted of his own and three other congregations. It was the first modern institution established to advocate vegetarianism. But, though small, its influence grew and a generation later its members formed the nucleus of the Vegetarian Society both in Britain and America. There are three key questions that I want to address. Firstly, where did Cowherd get his ideas from? Secondly, why were those ideas so successful and influential in that place, in Salford, at that time? And, thirdly, what did they lead to? Where did his ideas come from? The idea of vegetarianism stretches back at least to Pythagoras who lived some 2,600 years ago. His were radical, even revolutionary ideas. They were seen as subversive both to state and church. And in the early Christian era they were driven underground. The Church and the Roman state suppressed Pythagorean ideas, and the philosophy of Aristotle and the Stoics became the dominant world view. They saw nature in general and animals in particular as existing for the sole purpose of being exploited by humans. This philosophy chimed in with the idea that there was a natural order of things - an idea justifying imperial power and later the Divine Right of Kings. It also supported the Church's claim to stand between God and the people. The Reformation liberated much of Western Europe from ecclesiastical dogma and Pythagorean ideas enjoyed a new popularity as people experimented with previously heretical doctrines. A key figure here is the German mystic Jacob Boehme (1575-1624) whose work embodied the Pythagorean ideals of the kinship and sanctity of all life. Boehme influenced many of the more radical sectarians who emerged during the Cromwellian protectorate, including Thomas Tryon (1634-1703), the earliest English vegetarian propagandist. A generation later, Boehme's main disciple was to be William Law (1688-1743), the foremost theologian of the period. Law was a friend of John Byrom (1691-1763) who was the link between between these nature-loving mystics and Salford. Byrom was famous as a poet, author of the hymn Christians Awake! and best known in his own days as inventor of a system of shorthand. Byrom and other followers of Law were attracted to the teachings of a Swedish mystic Emanuel Swedenborg. Byrom's beliefs were shared by his friends and relations in Salford and Manchester. When John Byrom died his son built St John's Church, Castlefield, as a memorial. The Rev John Clowes - a kinsman of the Byroms - was installed as rector. Clowes (1743-1831) became the greatest exponent of Swedenborg, translating and publishing his works, despite being warned by his Bishop not to engage in such "wild enthusiastic opinions." In the 1790s he was joined by a new curate, William Cowherd. Cowherd had been born in Ambleside in the Lake District. In 1793, the followers of Swedenborg left the Anglican church despite the pleas of Clowes. They were led in Manchester by Cowherd. He set up a chapel in Peter Street. Cowherd died in 1816 and his successor as pastor was Joseph Brotherton who became Salford's first MP. The vigorous expansion of the church under Brotherton's leadership was matched only by his political energy. As a politician Brotherton campaigned for the end of child labour, he led the Manchester and Salford Peace Society, he was the first MP to speak against capital punishment, he was a leading opponent of slavery. He steered through parliament legislation to set up municipal libraries and art galleries. He supported every measure aimed at improving the prospects and welfare of the working classes. But the promotion of opportunity for the working classes involved for Brotherton not only public measures but private morality. People could advance in society if they lived healthy lives. To find true happiness, the people must not only pursue intellectual progress; they must also abstain from injurious habits. Thus Brotherton and his circle led the temperance movement, the anti-tobacco movement and were in 1847 responsible for founding the Vegetarian Society. Something must be said of Brotherton's circle. Family ties and membership of the Bible Christians linked so many of the key radicals. Foremost among them was William Harvey, Brotherton's cousin and a deacon of the Church. He was a Salford alderman from 1844 until his death in 1870. The first meetings of the UK Alliance - the main temperance organisation - were held at his home in Acton Square. He was a vice-president of the Anti-Tobacco Society. Harvey's sister, Martha, had married Brotherton in 1806 and she was a powerful organiser behind the scenes. She wrote the first true vegetarian cookery book in 1812 and dealt with the practical side of running events. Harvey's son-in-law, James Simpson, was a wealthy cotton magnate who had met the Harveys through the church. He toured Europe preaching the values of pacifism and temperance. And it was Simpson who became the first president of the Vegetarian Society. There were a variety of other characters associated with the church, such as John Kay who became the second mayor of Salford in 1846: probably the first vegetarian Mayor in the country! But it must be acknowledged that Simpson was the chief propagandist. Early in 1847 he engaged in a discussion through the letters column of a temperance magazine which resulted in a conference on vegetarianism being held on September 30th in Ramsgate. Brotherton chaired the conference and Simpson proposed the resolution that the Vegetarian Society be formed. The movement grew rapidly around its Salford heartland. It is sometimes argued that the Bible Christians were only one influence on the birth of the Society and that the other influence came from the Concordium - a utopian socialist community. William Oldham was head of the community founded on the principles of American writer Bronson Alcott. Oldham had already been connected with a short-lived forerunner of the Vegetarian Society called the British and Foreign Society for the Promotion of Humanity and Abstinence from Animal Food, founded in 1843. The Alcott House Concordium, as the community was known, had existed since 1838 and its members were utopian socialists, influenced partly by the Owenites (followers of Robert Owen, father of the co-operative movement). The American Alcott himself had visited the community in 1843. Its members shared with Bible Christians senior positions in the newly-formed Vegetarian Society. I want to suggest that in fact the influences were not so separate as might be thought. Indirectly, the Concordium was influenced by the Bible Christians. To explain this, I have to take you on a detour to the United States. A group of migrants left Salford for Philadelphia in 1817. The group was led by two ordained ministers of the Bible Christian Church - James Clarke and William Metcalfe (1788-1862). On their arrival in Philadelphia, the Bible Christians prospered and in 1823 were able to build themselves a church. Metcalfe earned a living from teaching and devoted his spare time to journalism and vegetarian propaganda. In 1850, an American Vegetarian Convention was called with Metcalfe as its president for its inaugural meeting. The convention established the Vegetarian Society of America. In 1859 he was elected president of the Vegetarian Society of America on the death of its first president, Dr William Alcott. Metcalfe himself died in 1862. How does Metcalfe's American ministry relate to a utopian socialist society in Surrey? In 1830, the American Bible Christians had two influential recruits, Dr Sylvester Graham (1794-1851) and William Alcott. Both served as presidents of the American Vegetarian Society. Metcalfe converted Graham, inventor of graham bread and graham crackers, to vegetarianism. Alcott converted his cousin, Bronson Alcott, to vegetarianism in 1835 and it was Bronson whose ideas inspired the Concordium community in Richmond. Influential in his day, Alcott's fame was superseded by that of his daughter, Louisa May, who wrote Little Women. By the time of the American Civil War, the Philadelphian branch of the Bible Christian Church had some 100 members - a position from which the Church later declined and eventually, in the first quarter of the 20th century, died. The American Civil War, however, presented an interesting dilemma to the Bible Christians. They were committed to the abolition of slavery and yet they also held pacifist views. It appears that the Church remained opposed to participation in the hostilities but several of its young men joined the Union army while its Ladies' Aid Committee supported the soldiers with money and food. Among those who joined the Unionist side was Henry Stephen Clubb (1827-1921). He resolved the conflict of principles by going into battle on the side of the abolitionists - but going unarmed! He rose in rank to captain then quartermaster-general before being wounded at the Battle of Corinth in May 1862. After the Civil War hebecame publisher of the Grand Haven Herald and served in the Senate of Michigan in 1873-4, while maintaining his involvement in the American peace movement. In 1876 Clubb attended a major exhibition in Philadelphia as a journalist where he renewed his contacted with the Bible Christians. It was then he was invited to become their pastor and remained so until his death in 1921. He was also for some time president of the American Vegetarian Society. I began by posing three questions. Where did William Cowherd get his ideas from? Where did they lead to? And why did they take off in such a spectacular way in 19th century Salford? The answer to the first question is straightforward. There is a thread of mystical belief linking Cowherd right back across the centuries to Pythagoras. These ideas were introduced into Salford society by John Byrom and picked up and developed by the succeeding generation. It is also clear, in answer to the second question, where these ideas led. Driven by an underlying belief in the kinship of nature, members of the Bible Christian Church exercised an influence out of all proportion to their number. They developed a political programme of emancipation. They led campaigns to free people from slavery, war and exploitation. They advanced the prospects for all to enjoy a good life through programmes of health and education. And the focus on health saw their campaigns against tobacco, alcohol and meat-eating. This leads me to addressing the third question: Why 19th century Salford? I believe that it was this linking of private ethics and public welfare that made the Bible Christians such a disproportionately powerful force in Victorian England. The industrial revolution had created an urban working class who hankered after self-improvement. A second reason lies in the process of urbanisation itself. When cities start to grow rapidly, they draw in people from the rural areas. Village life is essentially conservative and everything is governed by tradition. Urban dwellers are no longer bound by tradition and open to new ideas. They are also more likely to find others who share their ideas in the hurly burly of the city. So Manchester and Salford's place at the cutting edge of the industrial revolution opened people up to new ideas. Thirdly, it could be argued that Manchester and Salford in particular, and Lancashire in general, were highly susceptible to religious innovation. The Established Church had never really taken hold. Catholicism and even paganism were prevalent. In the urban centres non-conformism was dominant. As one writer put it, "religion was privatised to a unusual degree". Even a church of vegetarian mystics was accepted in the marketplace of religion. Finally, there was a shift generally in society's attitude towards nature. This was partly a reaction against the 'dark satanic mills'. It was partly that the industrial revolution had taken people from farming communities where animals were reared and slaughtered to towns where animals were pets. This romantic view of nature tended to be led by men like Brotherton, whose wealth and leisure created by the dark satanic mills, gave them an appreciation of the finer things in life: love of nature and things of the spirit. And one should not forget the contribution of Darwin. Evolutionary theory led to a genuine revolution in the way the relationship between humans and animals was seen. I do not mean to argue for a Victorian Phoenix in place of the 1960s version. The formation of a conscious, organised movement 150 years ago was just the latest in successive waves of popularity. Vegetarianism is not some new-fangled, New Age foible of the trendy. Its philosophy and practice have been an undercurrent in the West for 2,500 years.And in the East it has been dominant..